Cross Selector Valves are suitable for multi-directional cylinder or motor control. Selector valves are available as single or double selectors an have a variety of options available in their flow rate, porting, and actuator style. 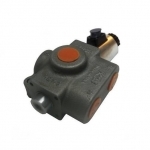 Cross Manufacturing Selector Valves are also available with soleniod operators.